Catherine got her kit today and made a necklace and earrings! 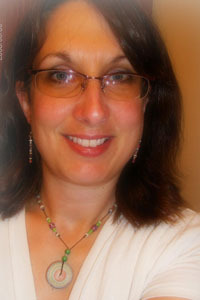 She said in her email to me that she has very little experience at jewelry making, but I think she did a marvelous job. 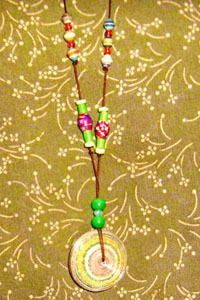 Every one of you got one or two of the saucer shaped bead, and she made that to be the pendant. I wish we had more photos, but Catherine’s camera was not cooperating….. you could still see and recognize some of the beads she used here. As promised, I am sending a strand or an assortment of unique paper beads for the first 10 who can share with us a finished jewelry. Keep creating…….paint a page, roll a paper bead, collage, write a journal……..whatever it is keep those creative juices flowing. Hi Janice! I just wanted you to know I received the “bonus” beads in the mail and I love them. Thank you so much! They are so nice. I can’t wait to make something out of them. Thanks everyone! Oh my name is Christine not Catherine so I don’t want everyone getting confused. The necklace isn’t really as delicate as it looks. I used number 10 crochet thread. I love using string because I am really allergic to metals other than 14k gold. I love the earthy look to it and I really love the green tubes (well I love all the beads but I never thought to wrap a bead around a bead}. Thanks everyone who’s beads I used. I have more to make and ALL the beads are beautiful! The necklace you made is verry nice. It looks so fragile. And I’m proud of course, because I recognize the green tubes that I made. It’s a good feeling to know that you wear them now.